Swanky's Sideshow, also called Swanky's Tent, is a large circus-themed tent where Swanky Kong runs three ball-tossing minigames. It only appears in the original Super Nintendo version of Donkey Kong Country 3: Dixie Kong's Double Trouble!. There is a Swanky's Sideshow in every area of the Northern Kremisphere, except for Krematoa. In the Game Boy Advance port, Swanky runs a minigame known as Swanky's Dash instead. At Swanky's Sideshow, Dixie or Kiddy Kong can play against Cranky Kong in a ball tossing minigame, with one of three different rules. In every version of the game, targets will pop up, and the player must knock them down by throwing balls at them. Cranky must then do the same with his own set of targets. A target will lower on its own if someone fails to hit it after a short time. In the endurance version the player and Cranky will compete to hit their own set of targets; the first one to miss a target loses. In Head to Head version there is a meter with five sections. The active Kong's face is at the top, while Cranky's is at the bottom. Each time someone hits a target, the meter will rise or lower a notch in their direction. The object is to hit enough targets so that the player breaks through the meter before their opponent. In Race to 25 the player and Cranky will race to see who can be the first to hit twenty-five targets. All games cost two Bear Coins to play. If the player wins, they will receive four Bear Coins, several Banana Bunches and an Extra Life Balloon in return. If they lose, Swanky will give them a consolation prize of a single Bear Coin and a few Bananas. Whenever Cranky wins or loses at each ball throwing minigame, different results occur on how he reacts. 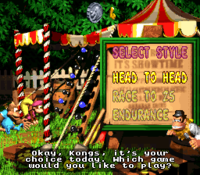 In Mario Superstar Baseball, Swanky's Sideshow's tent can be seen in the background of the Donkey Kong Jungle stadium, along with a billboard of Swanky Kong himself. The tent returns in Mario Party 5, where it can be seen in the background of the Banana Punch minigame. The music when winning against Cranky was later used as the end-of-level music in Donkey Kong Land III. This page was last edited on March 31, 2019, at 23:09.